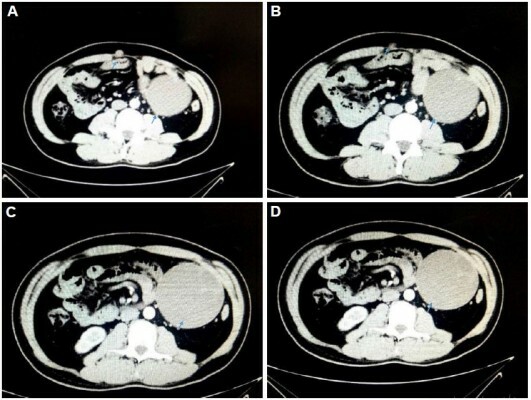 Background: Intra-abdominal desmoplastic small round cell tumor (IADSRCT) is a highly invasive malignant tumor that is rare in clinical practice. Anlotinib is a multitarget receptor tyrosine kinase inhibitor which inhibits vascular endothelial growth factor receptor (VEGFR) 1–3, fibroblast growth factor receptor (FGFR) 1–4, platelet-derived growth factor receptors (PDGFR) α/β, c-Kit, and Met. In our study, we present a record of IADSRCT which was validly treated by anlotinib. Case presentation: A 38-year-old man was admitted due to anterior abdominal wall nodule for 1 month. The nodule and intraperitoneal mass were resected and diagnosed IADSRCT. The patient received six cycles of adjuvant chemotherapy and his CT scan revealed metastasis in the right inguinal lymph node and omental lymph node. Anlotinib was then recommended. Anlotinib significantly reduced the lymph nodes after four cycles. The patient continued to use anlotinib as maintenance therapy, and the patient was in good condition. The side effects of anlotinib were high triglycerides and fatigue. However, its toxicity was controllable and tolerable. Conclusion: This is the first report about anlotinib being effective in the treatment of IADSRCT. This report may provide a new option for the treatment of metastatic IADSRCT.